March 22, 2019, marks twenty years since SPEAR first opened its doors. Wow, just wow. Please allow me to take a brief walk down memory lane so I can reflect on where we are today and share SPEAR’s humble beginnings with you. 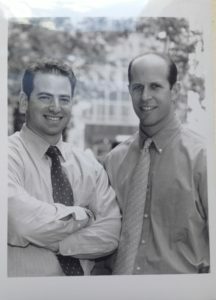 March 22, 1999 – 20 years ago today: Dave and I (with a lot more hair – see pic below) attended a talk about ski conditioning at my local Equinox gym where we met Dr. Glashow, a surgeon from Lenox Hill Hospital who was the guest speaker. SPEAR then was not SPEAR now. Dave and I each handed the doctor a business card that I had printed up at home that afternoon. Mine had my home address. Dave’s had his home address. The doctor thought we had two locations, was very impressed, and sent over SPEAR’s very first patient Vito Tricarico, a friendly, retired NYC architect, who walked into our rental gym space to be treated post-shoulder surgery. 1999: Our first pic as co-founders! Dave and I first met at a wedding. We were not invited guests. Dave was a waiter and I was a valet parker. It was the first week of PT school and we recognized each other in the catering kitchen. We became friends very quickly and realized that we shared an ethos, a grinder’s mentality, a “do whatever it takes” attitude. We found that we had a lot in common besides being wedding crashers. We both lost our fathers at a young age and recognized that nothing in life is handed to you, owed to you or should be expected. You make your own luck and create your own breaks. Eight years later, when Ryan Kitzen joined the company, he shared a similar story and attitude. I realize now that the thread of overcoming circumstances, of bringing a smile without entitlement, has been so woven into our company from the very start. As I look around at our team today, I clearly see a connection to SPEAR’s origin story. Call it the “law of attraction” or call it our culture, we are fortunate to have 325 humble, talented, hard-working, caring team members. For that, I am extremely grateful. I want to take this opportunity to recognize the efforts (in no particular order because it takes all of us working together!) of our team. The care coordinators who pay attention to setting the welcoming vibe for every patient that walks through our door. The award-winning therapists, who give of themselves so selflessly, passionate about making their patients lives better. Our techs, who are out there on the floor every day making sure our patients have a positive healing experience. And the HQ team who (has to put up with me every day) manages the behind the scenes magic to make the company run like a company. I owe deep thanks as well to our talented and skilled Directors and Regional Directors who lead with heart and lead by example every day. Twenty years is hard to believe. The emotion of GRATITUDE comes to the forefront of my mind. I truly appreciate all that we have accomplished together. The awards are special, but I read somewhere never to inhale. 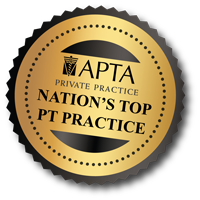 Receiving the pinnacle industry award – the APTA’s private practice section, Practice of the Year – was a highlight for us. One that we celebrated. We don’t stop there, however. I see much greater heights in the distance. I see our company growing the SPEAR way, the right way, and the thoughtful way. I see us graduating our 100th team member through our SPEAR future leader program. I see creating opportunities for growth for those that want it and have the discipline to develop the skill set. I see SPEAR transcending excellence in PT and adding state of the art wellness services that elevate our brand and increases patients’ expectation every time they walk through our doors. I see many more people benefitting from our special brand of physical therapy and wellness, with a much broader footprint. Spring started this week. Spring has always been a special time for me. The weather is getting nicer, the flowers are starting to bloom, but really and most importantly, it’s time for the baseball season. I have coached over 200 kids in the past decade and sit on the board for two little leagues, one in Manhattan (PSLL) and one in Brooklyn (Bonnies Youth Club) for inner-city kids, where I also played. I give up most of my afternoons during the spring to bring the concepts that have made SPEAR a special place, to these kids. We talk about what it means to be a good teammate, what a winner looks like, the importance of grit, hard work, and goal setting. 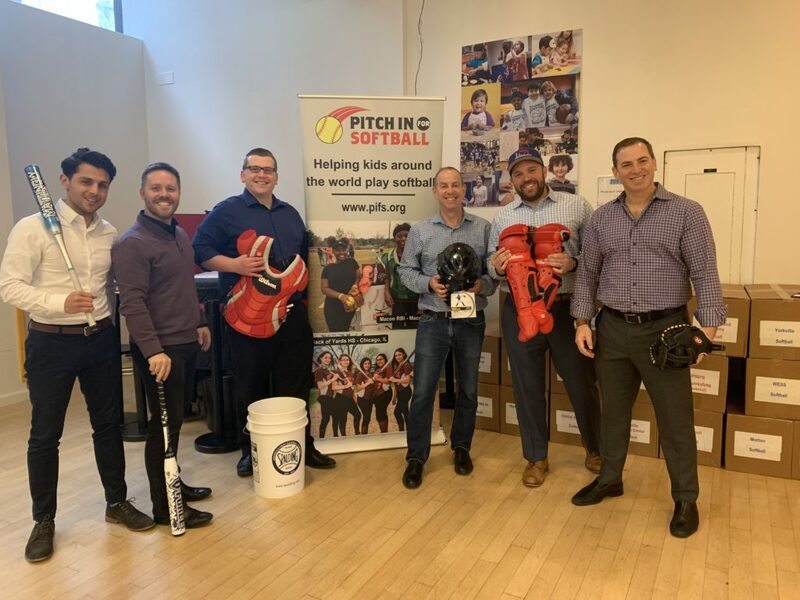 Just this week I was honored to speak to all the middle school coaches of Manhattan about keeping kids safe and the importance of correct throwing biomechanics. 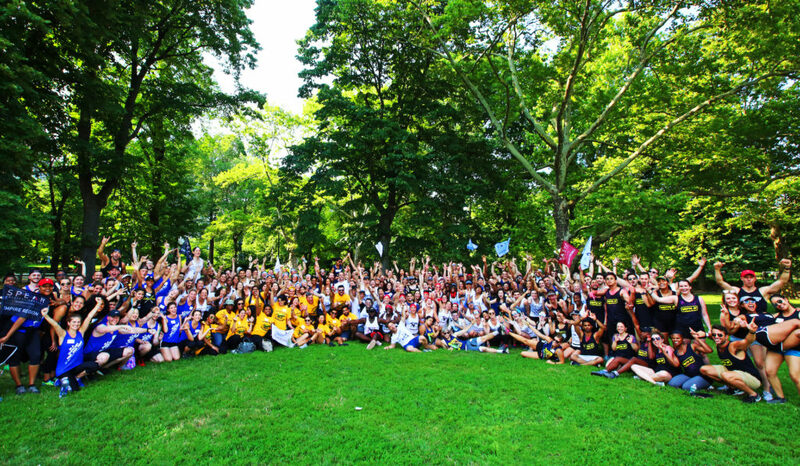 As some of you may recall, at our last annual Picnic in the Park, we pledged $10,000 to the middle schools of NYC. I am proud to say that we made good on that pledge and delivered equipment to all the city boys’ baseball and girls’ softball programs. Every team got five beautiful leather baseball gloves and a bat, and every girls’ softball team additionally got a pair of catchers’ gear. No child this year will be too embarrassed to try out for their school team because they couldn’t afford a glove. SPEAR’s annual picnic in the park which evolved from a small kick-ball game to a day of celebrating “SPEAR-it”, with an egg toss, tug of war, talent show laden celebration. Thanks for taking the time to read my note. Apologies for the length, but since 20 years can pass in the blink of an eye, I truly appreciate you taking a few minutes to allow me to reflect on SPEAR’s past, present and future. We are making a difference in peoples’ lives every day. This year, we will positively impact the lives of thirty THOUSAND New Yorkers. I hear the stories and get letters from grateful patients whose lives you have made better. Today, as I reflect over 20 years, how it all started by showing up to talk at Equinox and then renting a single room in a midtown gym, I am filled with pride and gratitude. We have 18 locations and over 150 talented therapists. Vito Tricarico, if he were alive, would no doubt have a huge smile on his face, and give us a big laugh and huge hug (and pose for a SPEAR social media pic!). I can’t wait to see how we continue to grow together and continue to heal the world – one person at a time. Thank you for your commitment to the team, whether you have been here 20 years or 20 days.